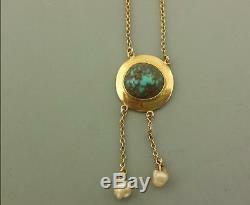 An elegant Arts & Crafts 9ct gold pendant set with a turquoise cabouchon and with two natural baroque pearl drops. Very much in the style of the period. 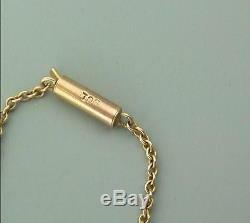 All in good condition with 9ct markings to the barrel clasp and the back of the pendant. 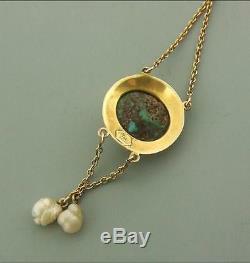 Pendant length 3.5 cms. 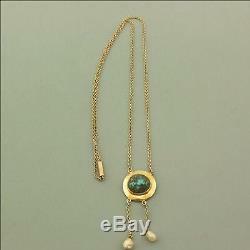 The item "ARTS & CRAFTS 9CT GOLD CHAIN AND TURQUOISE PENDANT" is in sale since Thursday, February 02, 2017. This item is in the category "Jewellery & Watches\Vintage & Antique Jewellery\Vintage Fine Jewellery\Art Nouveau (1895-1910)". 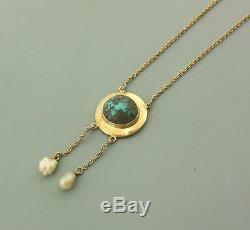 The seller is "metalminnie" and is located in Reading, Berkshire.